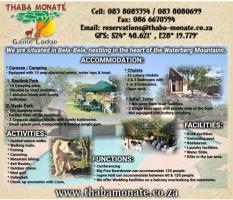 Thaba Monaté Game Lodge is situated in Bela-Bela, nestling in the heart of the Waterberg Mountains. - Equipped with 15 amp electrical points, water taps & braai. - Situated by most facilities. - 1 Ablution block with family bathroom. - Further from all the facilities. 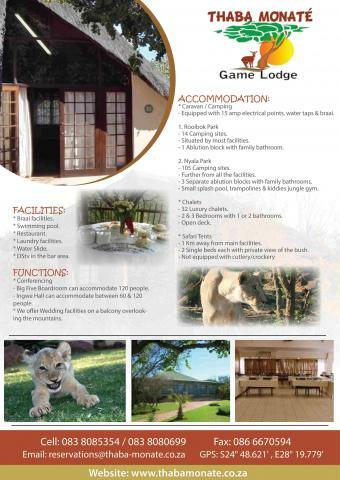 - 3 Separate ablution blocks with family bathrooms. - Small splash pool, trampolines & kiddies jungle gym. - 2 & 3 Bedrooms with 1 or 2 bathrooms. - 1 Km away from main facilities. 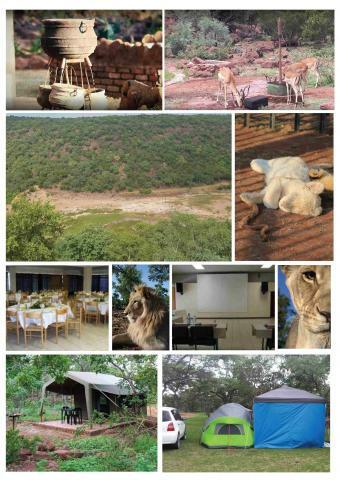 - 2 Single beds each with private view of the bush. - Not equipped with cutlery/crockery. * DStv in the bar area. 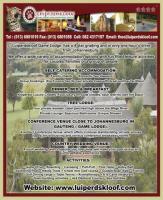 - Big Five Boardroom can accommodate 120 people. - Ingwe Hall can accommodate between 60 & 120 people. 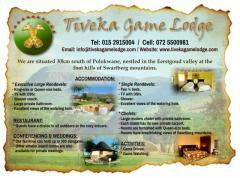 * We offer Wedding facilities on a balcony overlooking the mountains. * Close-up encounter with Lions.